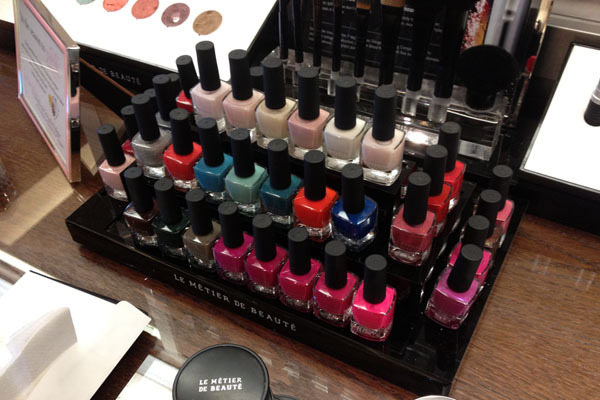 Consider this fair warning: you will be hearing about Le Métier de Beauté very often in the next week. I hope you don't get sick of them (and me!) by the end of it. Anyway, the treasure trove at the John Barrett salon wasn't solely limited to vintage kaleidoscopes. It turns out the company also designed 34 exclusive (but permanent) large-sized nail polishes for sale only at the salon. 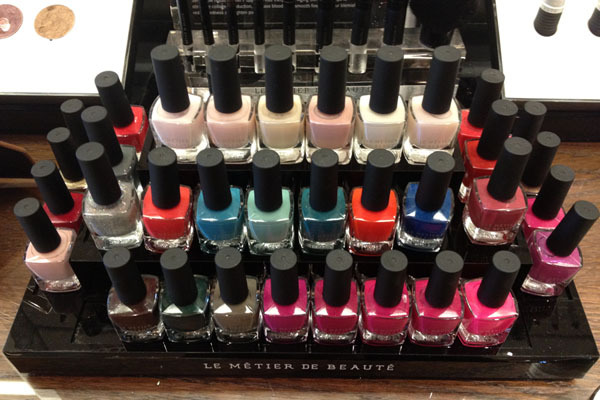 I know how you feel about exclusives, and I feel the same, but I understand this one since the salon offers manicure services and Le Métier has the monopoly on beauty up there. Unfortunately, I only had my iPhone with me during my visit, so these are not terribly color accurate, and some of them are a little hazy. However, let's still salute my brazen lack of self-consciousness when I took these pictures! There were scores of posh women going in and out of the salon but I just plopped myself at the counter and snapped the pictures without a care in the world. Shout out to Heather for being so accommodating to my crazy blogger tendencies! Each of these retail for $18 and are only available at the John Barrett Salon. Stay tuned for the next few days and I'll show you the pinks/purples, oranges/reds, browns, metallics/sparklies, and nudes! If you absolutely cannot wait, you can give Heather a call at 212-872-2700 x2714. ohh so pretty! i love those first three blues! I'm pretty sure I want to have babies with Gilded Lily. omg, i die. i want them all. i'll have to parrot the others in saying that gilded lily is absolutely gorgeous. I like all the blues in this array. Oh, that's really cool! The last two shades are the most exciting. Do you know the cost of a bottle? Mint Bliss is the first mint nail polish that feels adult enough for me to wear. Love it! carly- Those three were my picks too! Leigh- oops sorry for forgetting to mention that. It's $18 and I've updated the post to reflect that. 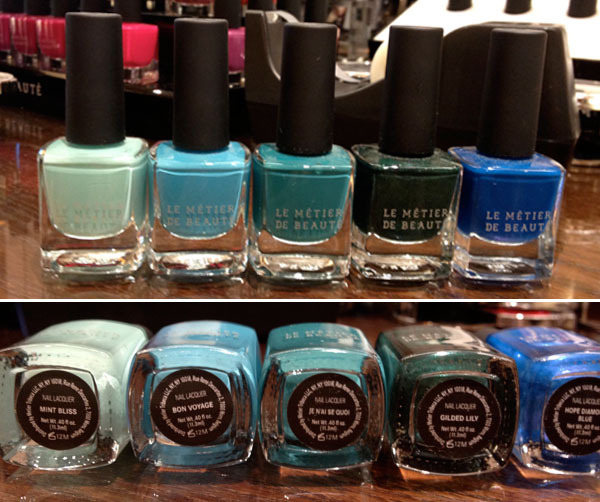 I don't mind the Le Metier de Beaute posts at all. 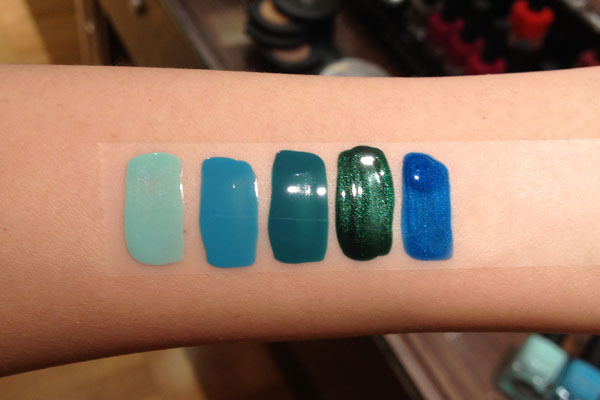 :D Beautiful swatches!!!!! Oh, how I wish I could try them! Bon Voyage looks stunning. Can't wait to see the color shades. Je N'ai Se Quoi are Gilded Lily are stunning!